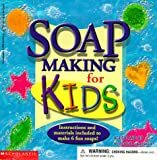 If you are interested in learning to make your own soap, you can purchase many soapamking books which Carrie's Creations is offering in association with amazon.com. Below are books that we think you will enjoy, and you can also use the search box if you don't see what you're looking for. Happy soaping! Soaps fragrant with cinnamon, "painted" with natural coloring, stamped or laminated, that fizz in the bath, and even have a written message! These 300 beautiful, easy-to-make soaps are gentle on your skin and a magnificent addition to bathroom décor. All use a simple melt and pour technique, and any craft, grocery, health food and drug store will have the supplies you need: a glycerin or coconut soap base, fragrances, additives (such as flowers and green tea), colorants (spices, dried herbs, cosmetic-grade color), and molds. What's really special are these recipes for bee-shaped fruited honey bars; deliciously scented lemon sage scrub; a heart swirl with smaller, decorative soap pieces embedded inside; a French cameo; the leaf-shaped mountain therapy blend with gold luster power; and many more! Unlike most books on soapmaking, which typically teach the cold-process technique, a method that requires working with lye and several weeks of curing time, The Soapmaker uses safe, simple, no-lye methods and ordinary kitchen equipment to make a variety of all-natural bath and grooming products. The book features an exciting collection of over sixty recipes, including whipped cream and transparent glycerin soaps, shower gels, bubble baths, shampoos, and conditioners. A delectable array of ingredients, from rich essential oils to tangy citrus juices to soothing herbs and flowers, can be modified to suit individual preferences for color, scent, and skin type. Ideas for wrapping and packaging are also included for readers who want to give their scent-sational handmade soaps and other products as gifts. This book makes it easy for crafters, natural-ingredients enthusiasts, and devotees of fine grooming products to enjoy the handmade luxury of natural soaps. Essentially Soap was written from the experience of a Chemist who worked in the soap and detergent industry for twenty years (and is the inventor on 14 US Patents.) "Dr. Bob" gives detailed discussions of rebatched, cold process, and melt and pour soapmaking techniques. Additional topics include the selection and use of natural and "unnatural" colorants, the use of essential oils, and how to compose a fragrance symphony blending fragrance "notes" to make a unique and pleasing bouquet. There are over 140 beautiful full color photographs illustrating the techniques and results plus over 30 recipes taken from Dr. Bob's own line of soaps. And for those unexpected problems confronting soapmakers, Dr. Bob has sprinkled the answers to the most frequently asked questions throughout the book. 5 star review: "It's a good book for your children. Great Fun! Makes for great family projects. Can get a little messy but that's part of the fun. You clean up with the soap afterwards. Good for the price!" Melt & Pour Soapmaking features dozens of luscious soap projects, with directions explicit enough for the novice and ideas sophisticated enough for the practiced soap maker. Accomplished craft designer Marie Browning (author of Beautiful Handmade Natural Soaps) explores a wide variety of technique variations, from chunk style and layered to additives, embeds, embossing, and hand milling. Slice a marbled soap at angles for the look of rock crystal; make delicate petal slivers using a silk rose petal as a mold; blend fragrance oils to yield the scent of sea mist or the power of Zen spice. There are also recipes for bath salts, massage oils, sachets, potpourris, and dusting powder. Orton explains the details of the three basic methods (melt and pour; rebatching, sometimes called hand-milled; and cold processing), progressing from super-easy through more complex in 27 well-presented projects. Besides translucent glycerin bars hosting colorful soap chunks, seashells, and even small plastic toys, items include rebatched and cold-process soap balls and bars made with botanical infusions, and other bath products such as salt glow and bath oil. A gallery of eye-catching creations by accomplished soap artisans provides further inspiration. Basic soapmaking instruction and specialty techniques like marbling, layering, and making transparent and liquid soaps. In response to fans of Cavitch's popular The Natural Soap Book, she now presents this "big book on soapmaking, " the most authoritative, comprehensive handbook around for making natural, vegetable-based soaps. Two-color throughout. Line drawings. * Clear directions and illustrations to guide you step-by-step through the entire process -- from buying supplies to cutting and trimming the final bars. * Recipes for old favorites like oatmeal/honey and avocado soaps to Susan's unique recipes for goat milk, borage, and even a tropical shampoo bar. * Creative wrapping and gift packaging ideas. * Formulas for exotic specialty scents like Holiday Spice, Sweet Earth, and Southern Summers. * Profiles and tips from professional soapmakers. Finally, a book on making liquid soaps at home! Using a simple double-boiler technique, you can create inexpensive moisturizing hand soaps, revitalizing shampoos, invigorating shower gels, soothing bubble baths, and much more. and all tailored to your skin type, to your hair's needs, or even to your mood! Discover how easy it is to master this special hot-process soapmaking technique and explore the art of this rewarding craft. Using simple, pure ingredients, such as cocoa butter, lanolin, and jojoba, you can create liquid soaps that are better for your skin, better for the environment, and just plain better than any you'll find in the store. Just start with a basic bar of white soap or produce yours from scratch. Add therapeutic and aromatic accents. Once you've tried the 20 recipes for hand-milled soaps, go on to bath salts, bath oils, bubble baths, massage oils, facial scrubs, and bath tea bags. Full-color photos show you how beautiful your soaps can be, and captioned illustrations explain each step. Complete recipes cover a variety of enticing creations: Peppermint Refreshment Soap, Mango Mint Shampoo Bar, Milk and Honey Soap, and Lavender Citrus Soap. Translucent Soap Jewels turn glycerin soap into giant emeralds, amethysts, garnets, and quartz. Bath salts with eucalyptus oil clear head colds. Grate colored transparent soap into an opaque white soap base to get Confetti Soap. Contrary to popular belief, making beautiful see-through soap doesn't require loads of special equipment, supplies, or overly complex preparation methods. All you need are some kitchen basics, such as pots, stirrers, and a thermometer; some inexpensive supplies from your local supermarket or craft store; and basic know-how--and you're on your way to creating your own personalized soaps. Learn how to make moisturizing milk-based soaps like Oatmeal, Peaches and Cream, and specialty soaps, as well as how to turn this hobby into a moneymaker. MILK-BASED SOAPS offers fool-proof instructions for creating twelve distinctive soaps, all suitable for either goat's milk or cow's milk. There are really just two ways to make soap -- the cold process and glycerin -- but there are literally thousands of ways to make that soap delightful. Beautifully colored and shaped soap is a joy to use; grainy soap is studded with sand or poppy seeds in an amazingly effective hand cleaner; and pure translucent glycerin soap is as gentle as it is clear. Shaping, coloring and mixing in additives are all covered in details. Soap, cut or molded into bars, squares, balls, domed bars, and round, is a joy to behold. Precious handmade soap can be personalized as gifts for the bride, for a newborn, or for a birthday by embossing a monogram onto the bar. Colors from subtle to pulsating add another dimension. Ingredients such as violet petals or coffee grounds create soaps that soothe and scrub. Sentimental soap made with May's lavender blooms is so romantic in November; pine scented soaps warm the month of December. Fire Light, Forest Garden, Gentleman Farmer, Lemon Verbena, Oat and Wheat Bran--these are just a sampling of the 30 wonderful recipes you'll find in The Soap Book. History, chemistry, equipment, plants, and oils - everything you need to know to create your own all-natural, hand-crafted, herbal, aromatherapy, and floral soaps is included. Throughout, Sandy shares tips, formulas, insights, and practical information gleaned from her 14 years' experience as a soapmaker. Readers can easily craft a wide variety of unique bath products from one basic recipe using the easy, step-by-step instructions. In a world filled with artificial and synthetic products, this book shows you how to create your own soaps and bath time luxuries using only natural ingredients and very little specialized equipment. Gorgeous photography and simple, easy-to-follow recipes will inspire you to start right away. Create a soap to suit your own personal skin type. Choose from a range of scintillating and mouth-watering ingredients, including peach, cucumber, ylang ylang, cinnamon, pine, peppermint, chamomile, lavender, sandalwood, chocolate, goat's milk and many, many more. Includes recipes for shampoo bars, body splashes, bath oils and foaming bath creams. Solve all your gift problems — with soaps for grown-ups and kids, men and women. Plus great ideas for packaging and presenting your finished soaps. One can still make homemade soap with delightful fragrances and interesting textures....Provides detailed instructions and recipes for basic lye soaps made with animal or vegetable fats, and for hand-milled and specialty soaps using almond meal, chamomile, glycerin, and milk that expand on those basic formulas. Shampoo and liquid are covered as well.